Contact angle, θ, is a quantitative measure of wetting of a solid by a liquid. It is defined geometrically as the angle formed by a liquid at the three phase boundary where a liquid, gas, and solid intersect. The well-known Young equation describes the balance at the three phase contact of solid-liquid and gas. The interfacial tensions, γsv, γsl, and γlv, form the equilibrium contact angle of wetting, many times referred to as Young contact angle θY. The simplest contact angle is called the sessile drop or static contact angle. This is when the liquid drop is resting on the surface and not moving. However, there is a range of stable contact angles that exist for surface based on factors such as chemical homogeneity, topography, and roughness. To capture the entire range of angles for a given surface, dynamic advancing and receding contact angles are measured. This is defined as contact angle hysteresis which is the difference between the advancing and receding angles. Hysteresis arises from the chemical and topographical heterogeneity of a surface, solution impurities absorbing on the surface, or swelling, rearrangement or alteration of the surface by the solvent [1, 2]. Advancing and receding contact angles represent the maximum and minimum values the static contact angle can have on the surface. The difference between advancing and receding angles can be as high as 50 °. Dynamic contact angles and contact angle hysteresis has become a popular topic because of the recent interest in superhydrophobic and self-cleaning surfaces [3, 4]. This is important since small sliding angles or roll-off angles (the angle the substrate must be tilted to move the droplet) are needed for self-cleaning applications. Hysteresis is also important in the intrusion of water into porous media, coating development, and adsorption at the liquid/solid interface. There are various methods to measure the static, advancing, receding and roll off angle. In modern optical tensiometers, the liquid’s drop shape is analyzed by using a digital camera to take images of a drop. The drop is then fit with the Young-Laplace equation with the tangent line drawn from the baseline of the drop to the edge. In the simplest of cases, a manual syringe is used to dispense a given volume of liquid by hand to the end of a needle tip. Then, the needle tip is gently brought into contact with the surface of interest, and the syringe tip is pulled away leaving the drop on the surface. All manner of dispensers can be used. The most advanced systems employing automatic pipettes can push out the desired volume and robotically place the drop on the surface. Dynamic contact angles can be measured using two different approaches; 1) changing the volume of the droplet or 2) using a tilting cradle. Figure 2 (a) shows the principle of the volume changing method. In short, a small droplet is first formed and placed on the surface. The needle is then brought close to the surface and the volume of the droplet is gradually increased while recording at the same time. This will give the advancing contact angle. The receding angle is measured the same way but this time, the volume of the droplet is gradually decreased. In Figure 2 (b), the principle of the tilting cradle method is shown. The droplet is placed on the substrate which is then gradually tilted. The advancing angle is measured at the front edge of the droplet just before the droplet becomes unpinned and starts to move. The receding contact angle is measured at the rear of the droplet before the trailing edge starts to move. [Figure 2]: Schematic of dynamic contact angle measurement by using (a) volume changing method (b) tilting cradle. with cosθ = contact angle, γl = surface tension of the liquid, and P = perimeter of the sample. In Figure 3, a complete force based contact angle measurement cycle is presented. In this scenario, the measured contact angle is always dynamic since the sample is moving against the liquid. 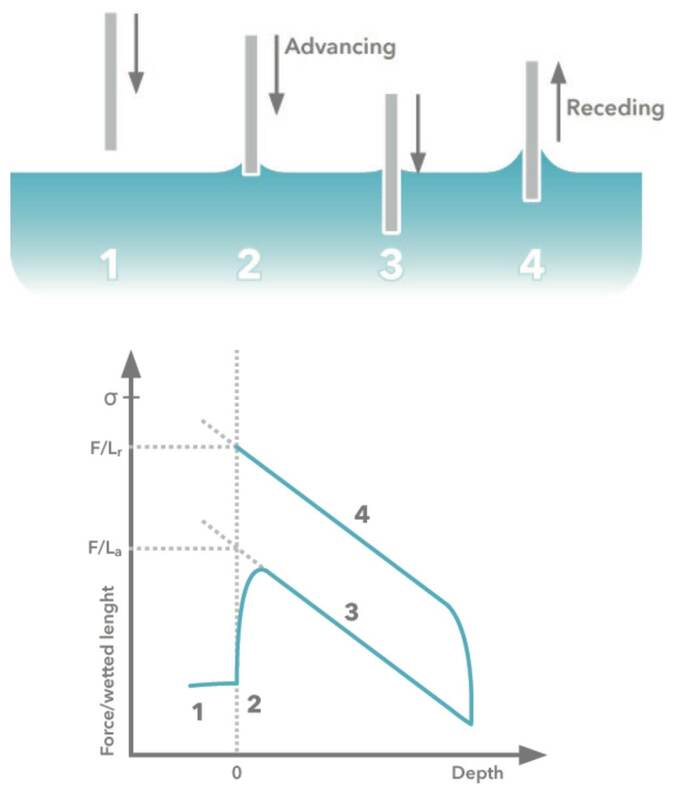 When the sample is being immersed into the liquid the advancing contact angle is recorded and when the sample is being pulled out the receding contact angle is measured. [Figure 3]: Dynamic contact angle measurement by using Wilhelmy plate method. An important application of the contact angle measurement is to determine a solid-surface’s characteristic surface free energy (SFE). The surface free energy of a solid is an equivalent parameter to the surface tension of a liquid and the units are the same mN/m or dynes/cm. Although the contact angle by itself gives a quantifiable indication of the wetting characteristics of a surface, it always depends on the probe liquid used. To measure a surface’s SFE several contact angles using several probe liquids are required and then this data can be fit to current theories to extract surface free energy values. For more background on the different surface free energy theories please see Biolin Scientific’s technical note. Optical tensiometry is the main measurement method for contact angles since both static and dynamic contact angles are possible. Homogeneity of a substrate can easily be estimated by measuring contact angles on several different places on the same sample. This is not possible with the Wilhelmy plate method since the calculated contact angle is the average over the entire immersed area. For the same reason, Wilhelmy plate method samples must be homogenous on both of the sides and edges and this can pose a problem in terms of sample preparation . Although contact angle measurement is many times straightforward, there are some special cases that require careful experimental design. A few special cases include fibers, samples that absorb liquid, and powders. Fibers and other thin objects can be measured by using optical tensiometer equipped with picoliter dispenser or with force tensiometer using Wilhelmy plate method. With an optical tensiometer, the picoliter dispenser can produce droplets with the base diameter of about 30 to 50 μm. With special optics and high speed camera it is possible to take an image of this small droplet and the contact angle can be determined in a similar fashion than by using microliter size droplets. Force tensiometer on the other hand can be used by utilizing a special holder for the fiber. Due to extremely small forces exerted to the balance, anti-vibration table and cabinet are required for reliable measurements. Both of these methods are reviewed more in details in application note 1. Many times contact angles are measured on the substrates that absorb the measuring liquid. In this case contact angles are typically analyzed as a curve for further analyses. In case one values is needed, care must be taken that the contact angle is measured and reported repeatably. Most often the first contact angle value measured is then taken as the contact angle result. Since the absorption usually happens very quickly, high speed cameras are often utilized. Contact angles on powders can be measured by using sessile drop measurement on a compressed powder tablet or by using the force tensiometer with the Washburn method. When compressed tablets are measured, it can behave like the absorbing substrate if the powder is hydrophilic or the droplet can stay on the surface if the powder is hydrophobic. The Washburn method is explained in further detail here. A. Marmur, “Thermodynamic aspects of contact angle hysteresis”, Advances in Colloid and Interface Science 50 (1994) 121. I. Gao and T.J. McCarthy, “Contact angle hysteresis explained”, Langmuir 22 (2006) 6234. L. Feng, S. Li, Y. Li, H. Li, L. Zhang, J. Zhai, Y. Song, B. Liu, L. Jiang and D. Zhu, “Superhydrophobic surfaces: From natural to artificial” , Advanced materials 14 (2002) 1857. R. Blossey, “Self-cleaning surfaces – virtual realities”, Nature Materials 2 (2003) 301. L. M. Lander, L. M. Siewierski, W.J. Brittain and E.A. Vogler, “A Systematic comparison of contact angle methods”, Langmuir 9 (1993) 2237. Force Tensiometers: Attension® Sigma Force Tensiometers for analysis of surface and interfaction tension, powder wettability, dynamic contact angles, critical micelle concentration, density, sedimentation and adhesion. Optical Tensiometers: Attension® Theta Optical Tensiometers for characterizing material surface properties and interfacial interactions between gas, liquid and solid phases.